Fisher Latham, left, Brevin Sims and Lauren Tolbert pose in front of Chattanooga School for Arts and Sciences earlier this month. The CSAS students participated in the Tennessee Bar Association's Catalyst program and co-authored a bill to make Tennessee voter registration automatic when teens turn 18. The bill has been introduced in both the House and the Senate of the Tennessee General Assembly. It's not often enough in these days of partisan-fueled vitriol that we get to read or see uplifting news that offers hope in tomorrow, but Sunday's Times Free Press gave us some — right there on Page 1. "Chattanooga students aim to remove barriers to voting through new bill," proclaimed the headline. 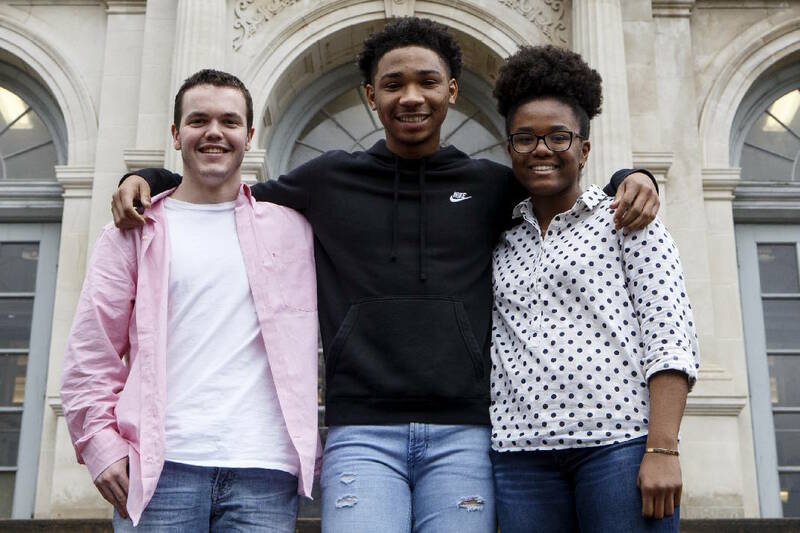 Brevin Sims, Fisher Latham and Lauren Tolbert — all high school students at the Chattanooga School for the Arts and Sciences — traveled to Nashville to lobby the bill before the Senate's State and Local Government Committee, and they met with Rep. Yusef Hakeem, D-Chattanooga. But they weren't just lending their support to Senate Bill 837, which would require every person in Tennessee with a driver's license to be automatically registered to vote when they turn 18. These teens actually wrote the bill. And then two lawmakers, state Sen. Raumesh Akbari, D-Memphis, and state Rep. Bill Beck, D-Nashville, agreed to sponsor the measure in their respective chambers of the Tennessee General Assembly. The students, along with about 17 other CSAS teens, were part of a project lead by teacher Kelly Davis, and they participated in a competitive program called Catalyst, sponsored by the Tennessee Bar Association's Young Lawyers Division. The CSAS class formed several groups that researched and penned five different bills. The research of Sims, Lathlam and Tolbert led them to believe it is simply common sense to automatically register eligible Tennesseans to vote when they get a driver's license, much the way males are currently registered for the Selective Service. The teens say it will make it easier to get people interested in their government and ready to vote. The voter registration bill had its root in Latham's interest in civic engagement and political activism, ideals to which Tolbert, one of the founders of the local student activist group Chattanooga Students Leading Change, also is devoted. Sims also previously proposed a piece of legislation as part of a government class project. Speaking of making voting an easier matter of civic engagement, consider this year's first priority of the U.S. House of Representatives: The For The People Act, also known as HR 1, is a sweeping expansion of voting rights, campaign finance reform and set of anti-corruption measures all rolled into one piece of legislation. The bill passed the House 234-193 on March 8, with every Democrat voting in favor of it and every Republican voting against it. By choosing to prioritize those reforms, the Democratic-majority House has signaled it is ready to set the bar high, fight big fights and root out the unhealthy parts of our democracy. For context, the GOP-controlled House last year reserved for its HR 1 the GOP tax cut scam, a massive handout to corporations and the wealthy. Back here in Chattanooga, Latham said he felt lawmakers in Nashville were more responsive to CSAS bill because it was authored by students. "They don't know anything about me, they just know I am some high school kid who wrote a bill with his peers and is going through the process," he said. "It's just a complete unique experience." "It's kind of showing that the youth can get involved in state politics and government at a young age. That's part of the reason I'm really pushing for this is because I want to have hope, especially in a time when people are down about politics in general," he added. "This will be small but it can mean a lot." Regardless of whether the bill makes it all the way to becoming law, the students say it's been an encouraging experience. As for HR 1, Democrat Sen. Tom Udall of New Mexico has said he would shortly introduce a Senate version of the bill, and as of March 12, Sen. Majority Leader Mitch McConnell of Kentucky had vowed that Republicans in that chamber would not allow the legislation to come to a vote there. Here's hoping Tennessee lawmakers don't do the same by parking the students' bills in committees to wither and die.